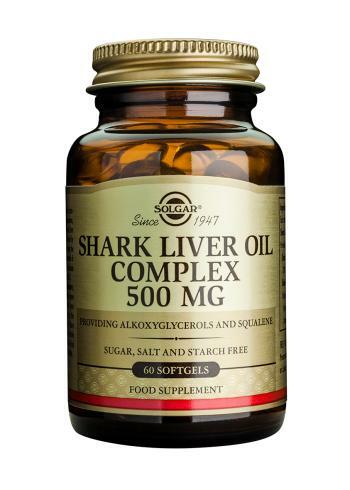 Shark Liver Oil Complex providing the most important shark liver oil constituents: alkylglycerols and squalene. Solgar® Shark Liver Oil Complex supplies standardised amounts of alkoxyglycerols and squalene, two important components found in Shark Liver Oil. Shark Liver Oil has been traditionally used by Scandinavian fishermen and the people along the west coast of Norway and Sweden for hundreds of years. This formula is specially processed to exclude any significant amounts of Vitamins A and D.
SUGGESTED USE: As a food supplement for adults, one (1) to two (2) softgels daily, preferably at mealtime, or as directed by a healthcare practitioner. Do not exceed directions for use.